SORRY I HAVE GONE TO A NICE NEW HOME. This is an upcycled table that we have put together. 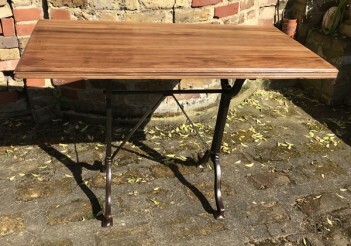 An antique French, iron table base has had a top added to it from a Satinwood chest of drawers. The wood was stripped, sanded, polished and waxed. It now makes a stunning side table, desk or hall table.